The end of South Harrington Street. November 2016. We just can’t seem to get away from the South Street area. 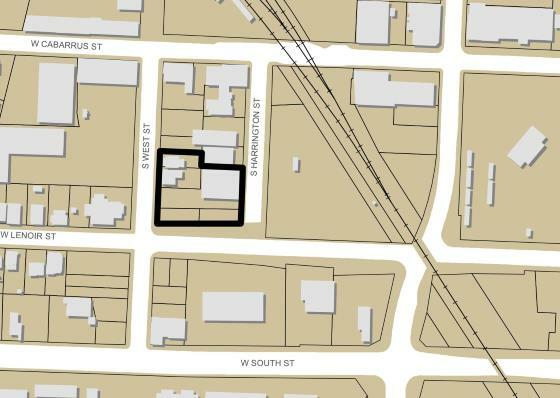 Recently submitted site plans for 522 South Harrington Street are for a “47 unit mixed use residential building with structured parking and street-level commercial space.” The building will be 5 stories tall at 75 feet in height. The address puts it at the dead end of South Harrington, near the current Amtrak Station, but the development also faces Lenoir and West Street. The reason Harrington dead ends rather than connects to Lenoir is because of a drastic elevation change. You can walk down stairs off Harrington to Lenoir though. The new project looks like it will take out the auto parts warehouse at the end of Harrington. Parking for that building is located at the very end of the street and faces Lenoir before the elevation drops downward. 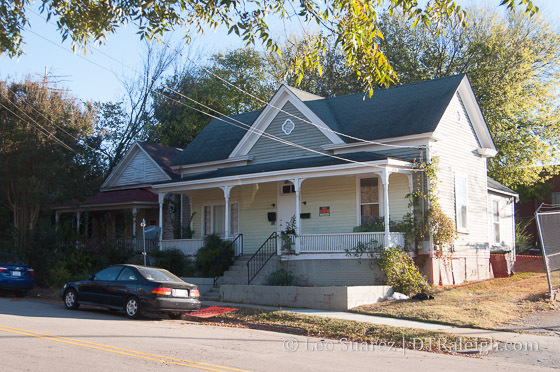 Around the intersection of Lenoir and West Street, the development will also take out two houses on West. Perhaps there’s an opportunity to move the houses? The corner is mostly an empty lot and surface parking. With this end of Harrington sitting on higher ground, the units will have a fantastic view of the downtown Raleigh skyline. It’ll be through the power station across the street but it still should be pretty nice. I’d love to have those victorian cottages moved/saved. Those are the last two on the block and two of last from the southern edge of the City’s Southside district (cool vintage pictures on Flickr from State Archives). Leo, I’ve walked that area a lot and think the elevation change became more prominent when the underpass of Lenoir under the railroad was installed…the approach from the west had to be dug out to get underneath. This is either the location or really close to the location of the previously proposed Metropolitan condos. That project was scrapped due to the financial meltdown in 2008. Metropolitan was an interesting project and I hope that this one will be a good one. Thanks Mark. I knew it was close! I’m glad there’s a record of those projects. Now it has me wondering if that substation was going to be replaced or if it was put there because the Metropolitan failed as a project. When Florian Companies planned the project it was clear land. The electrical demands of the projects that actually made it out of the ground required another substation near downtown and they more or less took the site from Florian. Dollar General is opening up a new urban concept store in the Edison apartments. It’s called GPX and it looks to have a small amount of groceries and house supplies. Sounds intresting.. I was chuckling about that earlier. I pay $2500 for my tiny bland apartment, but I want to shop at the Dollar General. That DGX store is going to be nothing more than a glorified convenience store. I see nothing wrong with it. There’s an article in the N&O about this corner of Raleigh, apparently more development is in the pipeline around Bolted Bread, Jim Goodnight owns some biggish pieces down there and he’s looking to redevelop them. The Goodnight redevelop is the Dusty’s Garage building at West & Lenoir. Development across from Boulted is a different developer… 42 condos/townhomes – construction fencing already up for that. Sorry, I see why that was confusing. I just meant in the general area (Dusty’s is only like a block from Boulted Bread). I will miss the houses though….were this Oakwood they’d be considered fine victorian cottages ripe for rehabilitation. But being some of the last such cottages on the southside, they are considered disposable. We are about to lose around 20-25 substantial houses built between 1890 and 1920 inside the beltline, equivalent to two blocks of Oakwood. OSB is coming out of the factories everyday. 100 year old floors and quality elaborate details seen in these homes….never to be seen again in typical housing. Amanda Hoyle is reporting in TBJ that the state has leased two properties downtown. One is across Peace from Seaboard Station, and the other is at the corner of Lane and Dawson.